Dynamically switchable LC Privacy Glass has the versatility to turn any open space into a private area. When used as a room divider, eGlass can instantly change from clear to fogged with a simple flip of a switch, separating the meeting room from the reception area. Our electronic switchable Privacy Glass sliding doors, not only act as room dividers but offer a unique and versatile alternative to the standard swinging doors. On this project, a prominent New York City based Finance company was looking to bring an open feel to the design of their new Office space, while still maintaining the option of privacy for meetings with their clients and investors. 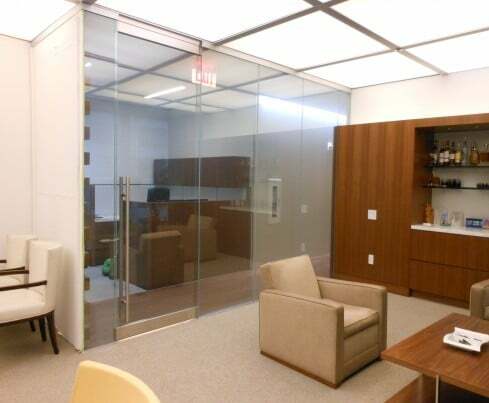 With a heavy emphasis put on the security of their transactions, our eGlass brand switchable LC Privacy Glass was used as full walls, room dividers and sliding doors in the Executive Offices & Conference Rooms to provide instant privacy on demand.